Or, How to Have a Fun Afternoon in a Seemingly Nondescript Part of New Jersey! For the second time in a week I had the pleasure of having the company of a lovely lady for an afternoon of postal adventures. Accompanying me on Friday was Sara, a senior at Penn who's writing a 25-to-30-page paper about me for her journalism class. Totally awesome. I picked her up at 12:30 and we shipped on over to New Jersey, though only after 20 minutes of halted traffic on I-95 courtesy a large incident. I had 11 offices on the agenda for the afternoon. With each visited I officially completed a corridor of post offices from Philadelphia to New York City, as well as all New Jersey post offices west of I-295. Sara had never been to a post office to have fun. Poor gal. First up were the 'twin' offices of Palmyra and Riverton, about a mile apart. 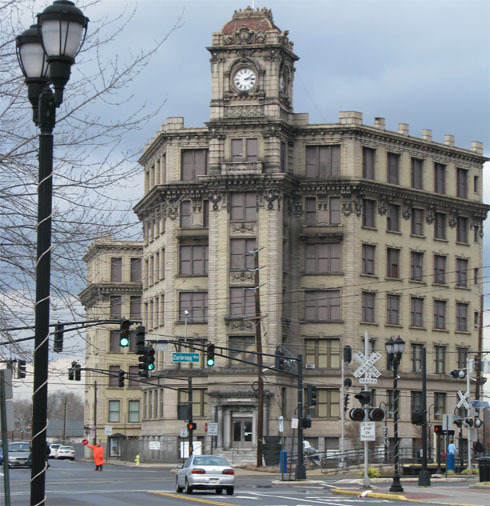 Driving up Broad St., I saw the Palmyra post office about 1,000 feet out, across the NJ Transit River LINE, which I'd taken from Trenton to Camden as part of a transportation class field trip last semester. It took Sara a few seconds to catch up in the spotting. I remember many of these towns as having had a nice main street. 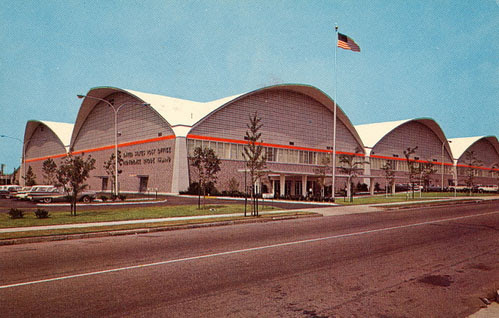 In any case, the Palymra post office was of a classic late-mid-century vintage. To the best of my knowledge the signage is not the original; it is unusual in that the font has serifs. The clerk was friendly and I bought 50 of the new 32-cent postal cards (item #224100). Got one cancelled for my collection. Many offices seemed to have them in stock from the get-go, which from my experience couldn't be said with the inauguration of the 29-centers last year. This telephoto, taken opposite the post office, captures one of the River LINE trains headed to Camden. Next up was Riverton, which I could tell right away had only recently been opened. Not only was the signage that bland new small-white-lettering-on-blue-rectangle vintage right inside the front door, but the POS station looked remarkably clean. The clerk confirmed that it was just three years old, and informed us that the old building was three doors down the block and was undergoing renovation courtesy its current owner. Sara's first unscheduled photo-op! She enjoyed chatting with the clerk a lot. The former site of the Riverton post office; WPA, 1939. No artwork inside. There used to be carriers at the former Riverton post office, but they were recently moved to the branch office at Cinnaminson. This is the uncommon case of a post office branch being larger than its parent office. I believe the Postmaster is stationed at the branch, as well, while parent Riverton is now a one-clerk retail operation. This office could have been terribly difficult to get to if you missed the turn at Andover Rd. It's recessed from the main pike. If you miss a turn on a pike in New Jersey, thanks to all the jughandles and the general distaste for anything left-turn, it can take a long time to recover. In this case, a 1.2-mile detour recovery would have been necessary. In any case, here there was no wait; walked in, got the postmark, took the photo, headed out. Sara was impressed. 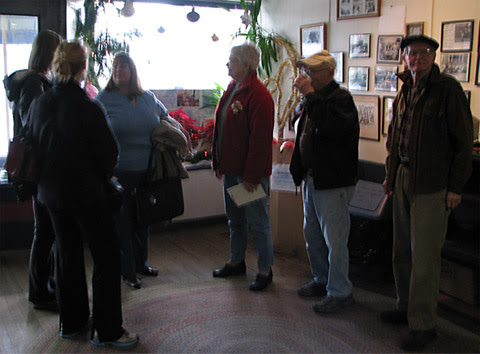 Riverside provided a pleasant stop at another nice WPA post office. This was a 1937 building complete with painted mural, which depicts the hotel that used to occupy the site on which the post office was built. The clerk has worked at the office a very long time, and she has a sense of humor about it. Occasionally she declares to customers that the girl with the goat in the painting is her! The post office is a bit unusual in that it posts not only a Roll of Honor featuring all of the office's Postmasters, but also a Roll of Honor for Letter Carriers(!) and a Roll of Honor for 'Distribution & Window Clerks' as well! How cool is that? They're framed and everything. It was very classy. Furthermore, I got to learn a few other features of the town's history at the P.O., namely that the town was founded as Progress, and that the Progress Post Office was first established Dec. 22, 1854. A couple blocks down was a gorgeous building that I was told now houses the town's historical society. Delanco, New Jersey! Or, technically, the Delanco Branch of the Riverside post office. I must confess, when I saw its setting I was a bit let down, after the grandeur of our previous stop. But I wasn't about to let its nonchalant strip mall character impede the adventure! Here I am at #3,000, and we'll find out why it was such a cool stop just below. Here, too, was a framed certificate of all the Postmasters of Delanco, NJ, up to its termination as an independent post office on May 31, 1954. The best part of the post office, beyond some of the other goodies I discovered and the nice brass P.O. Boxes, was senior clerk Sal, who took a bow when I told him that his was office #3,000. As a small-town Postmaster would, he knew every customer who came in. The customers, in turn, each professed their love for him and the service they receive in Delanco. A veteran, Sal was also knowledgeable about the post office's and town's history, and regaled me and Sara with a couple of stories. The 150th anniversary of the founding of the Delanco Post Office was celebrated by the entire town, and this was presented to the post office by the Delanco Township Historic Preservation Advisory Board. They did a beautiful job, didn't they? Sal explained that this first Postmaster, Micajah Dobbins, ran the local general store and was known for selling home-grown and -prepared pickles alongside his operation of the post office. As part of the sesquicentennial commemoration on October 5, 2007, Dietz & Watson, which operates a large facility in Delanco, brought in a huge barrel of massive pickles, free for the townspeople to enjoy. Stuff I never would have learned had I not stopped in to visit the local post office! Next time, the rest of the day's adventures. Ah, Providence. Imagine: I spent four years at Brown University and didn't even consider photographing every post office within 50 miles! That changed somewhat one day last summer as I was heading back from Boston to New York. Any postal tour of Providence must begin with the Main Post Office, whose retail operations share a building with the Providence P&DC, carriers for a few ZIP codes, and formerly the Southeast New England District offices (whose operations were removed and divided among Greater Boston and Connecticut Valley last spring as part of USPS's cost-cutting measures). The Providence MPO was featured on a four-cent 1960 postage stamp, celebrating the fact that it was the nation's first automated post office in the U.S., as part of a project known as Turnkey. You can read all about the then-$16 million post office and stamp at The National Postal Museum and Trains on U.S. Stamps. Here's a postcard of the post office (credit). The Brown University Station was discontinued in 2008, when adjacent university mail operations were transferred from historic Faunce House to Walter Hall across the street. Here's a photo of the exterior of the former site. Normally I would say that closing a campus post office is a bad idea. In this case, the East Side Station is rather close to the campus PO site that the effect on the community might not be significant -- although the discontinued site is closer to the administrative buildings on campus. Providence's Friar Station is a classified unit located above the mailroom on the Providence College campus is being considered for discontinuance under RAOI; in this instance it would be a bad idea to close the office. Students who live on campus and who don't have a vehicle would have to walk a mile to the nearest facility: North Station (which is also being considered for discontinuance -- another poor idea), or find their way under a highway to the industrial-area Providence MPO. Neither comes across as a particularly reasonable alternative, especially if you want to build a relationship with your supposed future generation of customers. Downtown you've got the Annex Station, which shares residence with the federal courthouse. Here the procedure for mailing a package is unusual, one I've never seen before in analogous settings elsewhere: You have to first walk over and get your package scanned through the x-ray machines (metal detectors?) at the courthouse security checkpoint before it can be given to the PO. This is to assure that the mail won't pose a threat to the building once it is accepted. Interesting. Another Providence post office being studied for closure is the Weybosset Hill Station, which seemed busy enough when I visited it. I doubt it'll actually be discontinued since it's the only facility in the area. Providence has some other offices, but I think that's sufficient for now. Hope you enjoyed the postal tour! I've finally fully updated my spreadsheet of post office visits and can declare with certainty that I visited 1,253 [new-to-me] operating postal facilities in 2011; an average of 104 a month or 3.4 per day over the year. The year-end total is 2,825, which doesn't quite jive with last year's figure... I think I realized that I forgot a couple days' visits and logged them in this year. Not bad considering I've had a job and graduate work. This count compares with 768 back in 2010. My only regret is that this year's assortment represents less geographic diversity than in previous years. Furthermore, I visited a total of 1,298 facilities, if independent APC locations, Box Units, and the former sites of discontinued post offices are included in the count. Though even this does not include the fact that, say, I photographed the former (WPA) Olyphant, PA post office in addition to its present setting. So, let's have the state rundowns! We're using the official, lower count (1,253) here. In rural communities post offices are more than places to buy stamps. 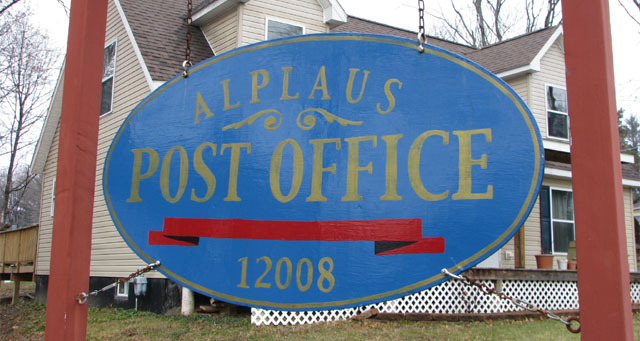 During my school's winter break I visited the town of Alplaus in upstate New York which, due to bizarre circumstances, faces losing an important part of its identity despite the present moratorium on postal closures. The Alplaus CPO was forced to close its doors on January 6. Residents felt as though they were losing a part of their community's soul. This situation is partly due to a bizarre provision in a USPSAPWU contract signed last April, which explicitly designates exactly 20 CPUs (Contract Postal Units) and CPOs (Community Post Offices  a type of CPU) for closure. The provision is supposed to ensure a maximum amount of work for union clerks and/or rural carriers, but its primary effect is the arbitrary inconvenience of affected communities, including several towns in the Northeast. You can read the provision here: APWU, USPS Tentative Contract. Among those 20, the Community [Contract] Post Offices (CPOs) in Alplaus, New York and Boscawen, New Hampshire closed the first Friday of this year. The Alplaus CPO made $40,000 a year  net, not gross. That is, USPS profited by $40,000 a year due to this location, and still closed it. The operation was scheduled to be discontinued (terminated) outright, but a letter from Colorado converted it to a suspension earlier during the week. More about that later. When it was suggested to me during finals by Andy Gilpin, President of the Alplaus, New York Residents Association, that I visit the small town just north of Schenectady to document a post office that would close January 6... well, obviously I was heading up! Alplaus (prounced AHL-plause) is derived from Aal Plaats, Dutch for place of eels. (Alplaus lies along the Mohawk River  the Hudson's largest tributary.) The location has served as the setting for a couple of historic events, including that shown on a state historic plaque, below. The town has been around for quite some time, and so too has its post office. Town historian Cliff Hayes notes: "National archives and records administration states Alplaus PO was first commissioned Oct. 4, 1888 to Joseph Hanigan. Hanigan operated hay and feed business located at the railroad tracks ... The PO served the many crop farmers in the vicinity; mail being transported by train from Schenectady." Discontinued in 1908 (possibly due to the advent of Rural Free Delivery), it was reestablished in 1922. The office has operated as a contract unit since 1973. In the past, when the Post Office Department (or, now, USPS) discontinued a post office, it would often be replaced by a contract operation known as a rural branch or rural station. Those terms have since been replaced with the catch-all CPO. CPOs could still be established anywhere USPS's newfangled "Village Post Office" could go; except the latter offer far fewer services to the affected communities. Before its postal operations were established as a CPO, there was question as to whether Alplaus would retain its office at all. 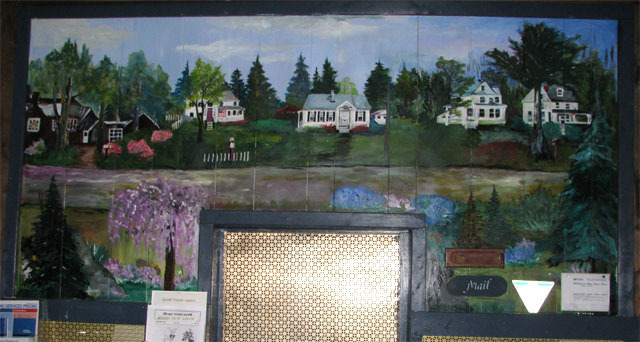 Longtime Postmasters for both Rexford and Alplaus operated post offices out of their homes, and both retired in 1972. 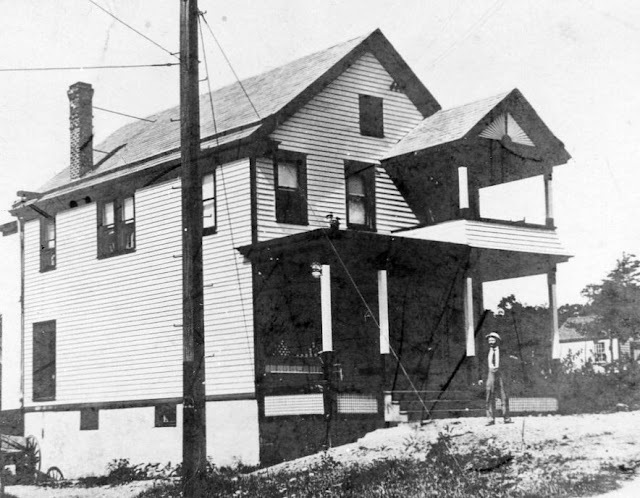 The Postal Service wanted to combine the two operations in a new building, but the town feared losing its identity and center of social life  just as it does today. With the help of Congressman Sam Stratton, the decision was eventually made to house Alplaus postal operations on a contract basis. The Alplaus Post Office, ca. 1910. Courtesy Cliff Hayes. The town also successfully fought an effort by USPS in 2001 to reduce the house of operation from 28 to 12. Once again, the town enlisted its local Congressman and the hours remained intact. Mr. Hayes notes that the operation was profitable then as it remained to the present. When I arrived at the office late Saturday morning, there were 11 residents spending time at the post office. (To be fair, this wasn't typical; they knew I was coming. However it's not uncommon to see five residents at the post office at that time on a given week.) I took the opportunity to ask the fine folks a few questions. For instance, I noticed there were only two cars in front of the CPO. Of the 11 folks at the office, only one regularly drove; the rest walked. 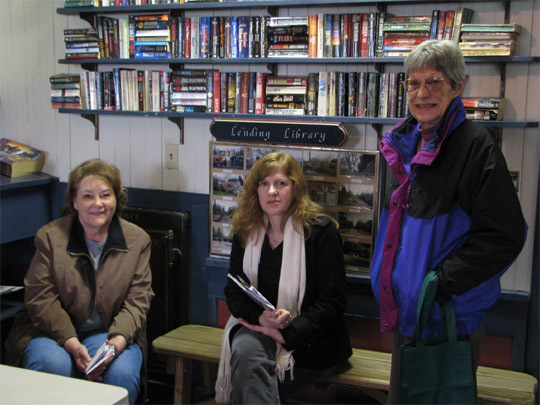 I asked that question because the answer makes an important point: I'd imagine one might say that the residents of this town are merely complainers, that the nearby Rexford post office, a 1.1-mile drive, is an easy substitute for those who use the Alplaus CPO. But I believe the operative word is drive. Kathleen Schnitzer was one of the residents at the CPO that morning: "It's a nice walking town. You [always] see your friends, and sometimes it's the only reason people leave their house every day." Jessica Evans added: "It's the routine of village life." 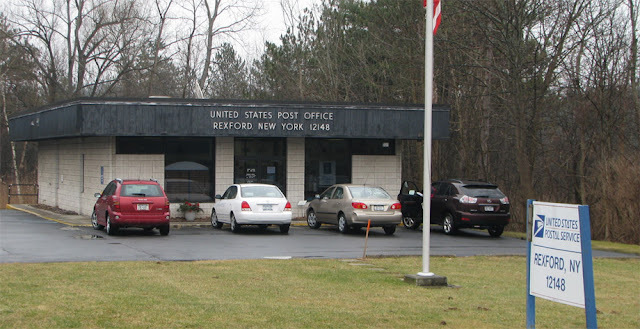 While the main road through Alplaus is conducive to walking, the Rexford post office is best visited by car. As I was taking photos across the road, six cars pulled into the parking lot. The 40-plus-mph drag (shown, along with a photo of the post office itself, below) isn't safe for pedestrians, and certainly not for the more elderly residents of Alplaus, some of whom don't drive. One 24-year Alplaus resident thinks the result of the postal closure could extend beyond mere inconvenience: Stephanie Wolos stated that "people choose to live here partially due to the post office. I think it could affect real estate values." For the members who use the post office on a daily basis, she added, "It's unbelievably sad for us." If you've never seen a Postmaster greet someone by name by the sounds of their entering the building, it's always an impressive sight. 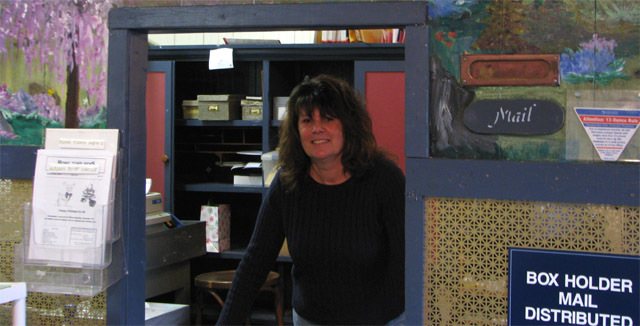 Like small-town Postmasters everywhere, Alplaus's 'Contract Postmaster' Kathy Boyle is vivacious, knowledgeable, energetic, and knows (knew?) her customers. Beginning as a temp in 1990, she held the contract and officially operated the CPO since Nov. 2001. By and large Kathy interacts with the adults in the community, but she is familiar the goings on with residents of all ages  even what's happening at the nearby high school: "The only time I see the young kids come in is when the interim reports [from school] come in." Usually the parents will call Kathy up and tell her to hold the mail until they arrive. That is one reason why many Alplaus residents opt against the available free delivery: security. Stephanie Wolos said that she happily pays $42 a year for the security of a PO Box with Kathy, "and I would be willing to pay more than that." While the community is close-knit and I didn't get the impression that there was any crime of which to speak, the PO Box keeps the cats out of the bag, as it were. And remember, you don't meet your friends if you walk out to just your own mailbox. A couple of residents noted that they felt safer knowing that Kathy is always on duty and monitoring the town  passively or otherwise. For example, if a resident doesn't pick up his/her mail for a few days, Kathy might just call directly to see if everything is alright: "If I don't see Norm we find out where Norm is." And a sigh of relief might sound like this: "I was just about to peek in your garage window and see if you were home!" That is an echo of a story I've heard at small locations all over the country, and you can't get this level of service or community involvement at a larger office! It's just another of many services, official and informal, that are best provided by a postal operation at the heart of the community it serves. An interesting incident occurred in early November when a man identified as a local APWU executive walked into the Alplaus CPO and started taking photographs. When asked about his intentions, a resident recalls: He "claimed he would help us; that he was 'on our side'; and that it was not financially sound for USPS to have the local carriers take over delivery from folks who have boxes here." Furthermore, he specifically stated that "the union did not ask to have this post office closed." Rather, the claim is that USPS willingly proposed the aforementioned provision in the APWU contract, and the union merely accepted it. This claim could be contradicted by some APWU documents on CPUs. An August 2011 document titled Contract Postal Units (CPUs); Returning Work to the APWU declares, "The union is attempting to identify Contract Postal Units (CPUs) that perform work that should be returned to our members." A 2009 article titled Fighting Contract Postal Units; Protecting Retail Jobs speaks for itself. When a Post Office is being studied for discontinuance, personnel must photograph the facility and its surroundings as part of the proceedings. It is probable that the supposed APWU defender's photographs of the office provided what was necessary to proceed with the closure of the office. At least two other CPO closure decisions were remanded by the PRC after the Knob Fork precedent: Foraker, Indiana in 1984, and Ranchita, California in 1985. It is unclear how the revised decision to suspend the operation, as opposed to outright discontinue it, will affect the proceedings. Additionally, even if Alplaus were to win its case with the PRC, the Postal Service could decide to close the operation anyway. 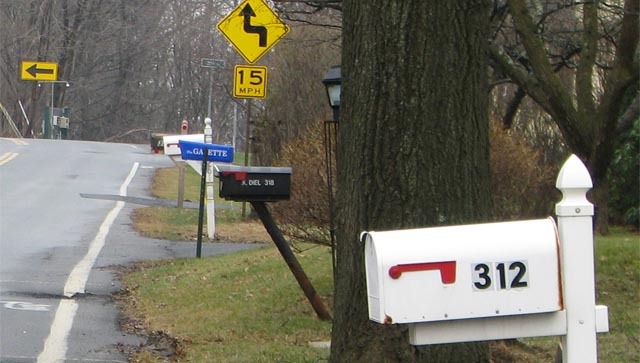 A few new mailboxes have sprung up on Alplaus's main road, and other residents are filing to have their mail delivered to PO Boxes in Rexford. However, most residents I spoke with expressed that they would gladly take the opportunity take a PO Box back at Alplaus as soon as it might reopen. The town would consider opening a VPO ("It's better than nothing. "), but astute residents in this town are aware that many of their postal desires could not be met at such a location. One example is the aforementioned ordering of specially requested stamps that Kathy provides. Another was told to me by Jessica Evans, regarding package shipping: "We ask [Kathy] what's the cheapest way to get it there and how long it will take, and she helps us. We have a conversation before I mail a package, and it makes me feel secure." By contrast, all Village "Post Offices" can do is give you a Flat-Rate box and take it back in. I inquired as to whether the residents had Internet access; and if so, did they still mail bills at the post office? Pat Beaver responded: "Most have Internet, but you'd rather come here anyway." Is that right? "Absolutely. There's nothing personal on the Internet." The Glenville Fire District owns the building which housed the Alplaus CPO, and the site will remain as it stands for the time being. 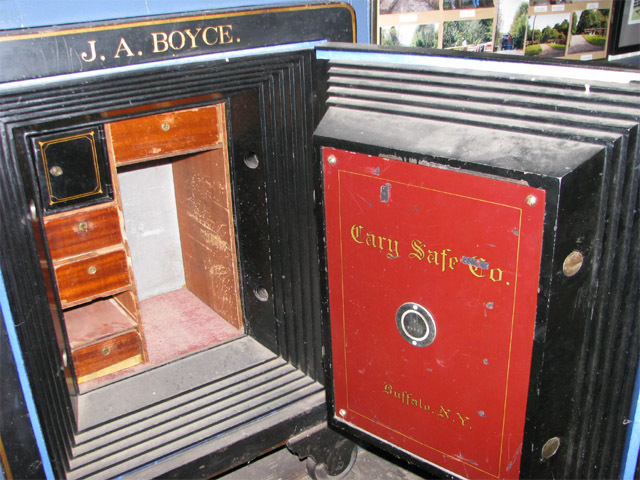 Allow me to present some of the building's other gems: a classic safe that you'd need a truck to haul away despite the fact that it's got wheels; mural panels painted by local artists in the '90s that beautifully represent the buildings in the town; and a wall of photographs and newspaper articles detailing events from town history. I think Mr. Hayes says it best: "My family established residency in Alplaus exactly in 1911, 100 years ago. Closure of the Alplaus PO would be losing part of the family." At this point, only one question remains: Postally speaking, will there be an encore for Alplaus? 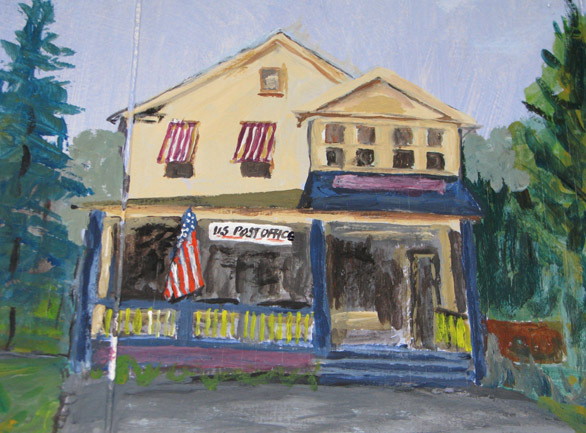 It's a shame that it's the quaintest post offices -- you know, the ones with the most local character -- are the ones that seem to be slated for closure. I visited a few of said in Vermont this past week, and wanted to present one to you this evening! West Newbury lies within a couple of miles of I-91 (though not in close proximity to an exit) about halfway along Vermont's border with New Hampshire. This is country wherein the large towns are actually rather small towns. West Newbury is not a large town by anyone's standard. I made the mistake had the adventure of approaching the town from the east -- that is, from Newbury -- along the winding Moore Hill Road, a dirt lane, though other avenues to and in town were paved. 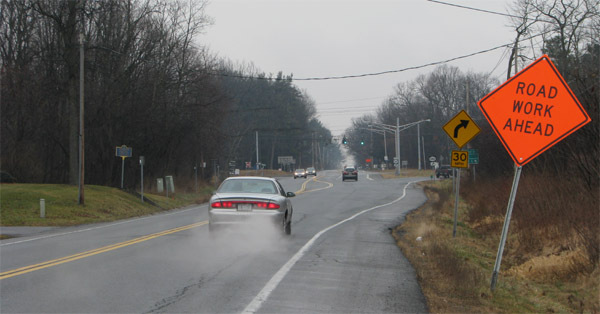 The community of West Newbury is more of a crossroads lined with houses than a town. But that's what makes this post office charming. I didn't come across any commercial establishments in the community besides the PO, and if there was any doubt that the post office serves as the town center... well, let's have a look! Of course, USPS puts the 13-ounce rule sticker on the box, despite the fact that it's physically impossible to place / shove / maim anything larger than a letter in there! But the nicest thing about West Newbury is The Backroom. It's to the right in the photo below. The subtitle for The Backroom -- a little shack with a sliding glass door -- is Neighbors Sharing With Neighbors. It's the coolest thing: a weather-protected cubby for community information, with all material contributed by members of the town. It's got a mat on which you can wipe your feet, and spots on the wall for Events, Public Notices, and even a Lost and Found. There was also a shelf with magazines and some local newspapers. And again, it's right by the post office, where the townsfolk go every day. It's not locked (unlike all the post offices in northern New England during the weekends)... because there's no reason for it to be. What a cool idea! This was a joy to find.